All right, let's take a left turn. Yes, I'm going to working on getting the last of the Unfortunate Wordpress Experiment out into circulation again, but I also decided that I wanted to explore some more of my dear old Motherland across the pond. I recently saw on Reddit that someone had taken the time to make a map of England with every county flag show in the boundaries of it's respective county. Which made my ears perk up a bit, because I didn't know that the counties of England actually had flags... (I suppose I should have, really, but never bothered to find out.) So I figured why not instead of boring you with a bunch of flags you've seen me do before, why not challenge myself and explore all the flags of England? So I'm going to try and do them two at a time and see where we end up-and since you might as well do this is some semblance of a logical way, I'm going to start with Cornwall and Devon. Also, the Irish didn't like him much and, being heathens at the time, tied him to a millstone and tossed him into a stormy sea. Legend is that the sea then became calm and St. Piran floated to Cornwall in a pretty chill manner, where his first disciples were reportedly a badger, a fox and a bear. All in all, I dig it. The black and white combo isn't usually seen a lot of flags, which makes this one pretty striking. I like that the origin story isn't about abstract notions of Cornwall- it's a natural process associated with the region and rediscovered by it's Patron Saint. The three colors of the flag: green, white and black have long been associated with the county. Their Rugby Union team, Exeter University and Plymouth Argyle F.C. all use them. Lord Exmouth flew a flag with similar colors during the Bombardment of Algiers. There's meaning to the colors as well: The green stands for the rolling and lush hills of Devon, the black stands for the high and windswept moors (specifically Dartmoor and Exmoor) and the white is for the salt spray of their coasts lines and the China Clay industry. 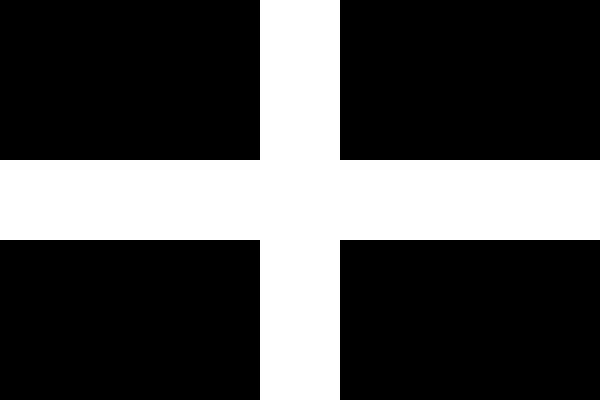 The flag itself is dedicated to St. Petroc. Our journey around the counties of England has begun! Remember, until next time, keep your flags flying- FREAK or otherwise!